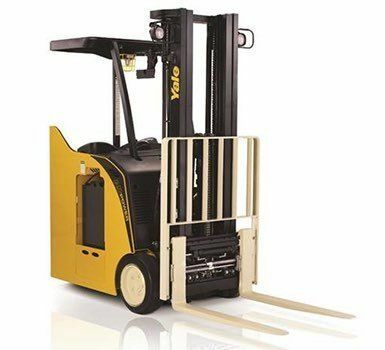 Electric forklifts are generally favored for indoor operations because they have zero emissions. However, they are increasingly being used for outdoor duty and nowadays there are rugged, energy-efficient electric fork trucks available for just about every application. Do you need a compact, three-wheel forklift capable of driving through a standard-sized doorway? Perhaps a Mariotti narrow aisle lift is right for you. What about a heavy-duty electric truck capable of hoisting a 35,000-pound load? Your options include the innovative Versa-Lift 25/35. Environmentally friendly — Powered by battery instead of an internal-combustion engine, electric forklifts produce no harmful emissions. Quiet — Since they run on battery power, electric lift trucks are far less noisy than propane and diesel forklifts. 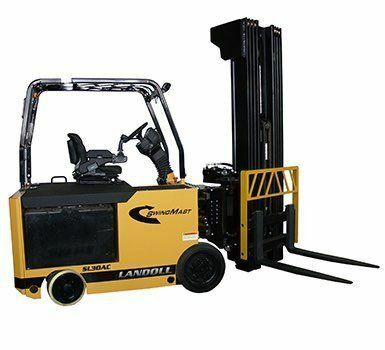 Maneuverability — Electric forklift trucks tend to be more compact and maneuverable since they are not powered by a bulky internal-combustion engine. Refueling cost — The cost of recharging the battery overnight in an electric lift truck is generally less than replacing gas bottles or filling a tank with diesel fuel in an IC-powered forklift. Lower total cost to owner — Maintenance and service can be less costly for electric forklifts since battery-powered lift trucks have fewer moving parts. And because they usually enjoy a longer life span, electric forklifts are often seen as having a lower overall cost to the owner. Q: How do I take care of batteries and chargers? A: Most electric forklifts are powered by a lead-acid battery, but new technology is changing the game. Hydrogen fuel cells, a clean, energy-efficient option that streamlines the time-consuming refueling process, are now gaining in popularity — especially for companies with larger fleets running multi-shift operations. However, many industry insiders believe that lithium ion batteries are the wave of the future. They are more expensive, until you do the math — that’s because they are more efficient than lead-acid batteries and require zero maintenance. Q: How do I know whether an electric forklift is right for my business? A: When it comes to selecting the right forklift for the job — and for your particular warehouse and storage environment — your best bet is to talk to an experienced electric forklift expert. The team here at NITCO will ask a lot of questions about your warehouse, workflow and more to help you decide what equipment will best serve your needs. We’re conveniently located with six branch offices throughout New England. Plus, we operate an Integrated Warehouse Solutions Center at our Shrewsbury, Mass., branch where you can simulate actual warehouse conditions (right down to setting custom aisle widths) as you check out a wide range of amazing equipment and warehouse efficiency products.